How Does Banksy Make His Art? 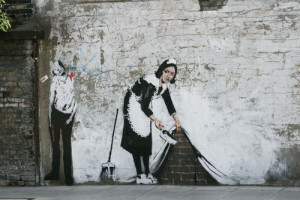 Banksy is a popular street artist turned filmmaker turned author. His work is often political, sometimes combining violent and peaceful imagery into a single work to make a statement. For example, one piece features an image from a famous photograph of a napalm attack from the Vietnam war where a young girl is running from a smokey horizon. She is naked and horrified and in the original photograph is being followed by soldiers in protective gear. Banksy’s graffiti of the young girl features her, with the same horrified expression, except she is flanked on either side by Mickey Mouse and Ronald McDonald. If you’ve seen an image of interesting or thought-provoking wall art online, there’s a good chance he produced it. But how does he manage to get his art up without being caught? Graffiti is, after all, seen as a form of vandalism and is therefore punishable by law. It is said Banksy uses stencils to create his works. Stencil artists make outlines of their designs for wall art in advance of putting them up. This gives them time to plan out the work, allowing them to finish it in one session quickly enough to not be caught by police. Stencils are typically drawn on cardboard or other thick material that won’t allow spray paint to bleed through and cut out to preference. This allows artists to add detail and decide on how they’ll employ coloring as well. 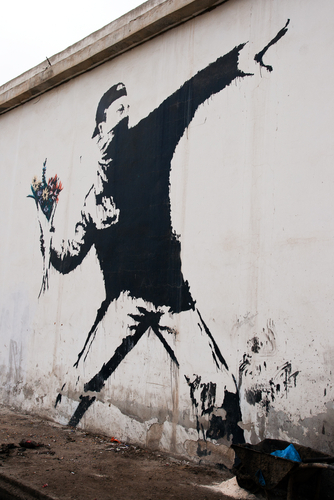 While Banksy didn’t invent stenciling, his work has played a major role in popularizing the method. Some graffiti artists criticize stenciling as “cheating,” but that doesn’t take away from the interesting look that stenciled works have.